You like Cop shows? Detective shows? Sci-Fi? Clockwork Orange? Sweet animation? Makes you think? Stop reading and go watch if any of the above woke something up within your nether regions. No, there is no Season 2. That didn't happen. You dreamed that. Psycho-Pass Me More of this Show! First off: Thank the Jesus's ( Jesi? ) that Funimation allowed Crunchyroll to bring in more anime. This show to be honest didn't really start off as a genre I was interested in at the time. Sci-fi, futurey, technological singularity? I'm not that much of a nerd. But holy crud that first episode does really well to draw anyone in. Then you get immersed into the setting, and the characters and what they deal with, and overall you start to care about the show and its characters, something most series nowadays tend to overlook. If memory still serve, Psycho-Pass takes place in the some-what-distant future of Japan, where everything is run by the Sibyl System. A (supposedly) flawless system where everyone's' lives are dictated by your Psycho-Pass. The Psycho-Pass is a number that determines how much stress a given person may be experiencing. At a certain point, that person would be given a crime coefficient, which determines how likely he/she will commit a crime. That's when law enforcement officers take 'em out with the Dominator. "Woah!? What is that??" I'm glad you asked. It's a gun that allows an officer to obliterate that person who's theoretically going to commit a crime. "Wow. What could possible go wrong in such a perfect world?" That my friend is what you need to find out. Psycho Pass is not just an amazing Anime, it's an amazing show or "If Minority Report had been done right"
Just watch it. I really don't have a lot to say because even the premise is better discovered by watching. That's how good of a show this is, even the setting could be considered a spoiler. And since Crunchy wants me to write something longer I can tell you that this show will really make you question your personal notions of what is bad, what is good and what is a necessary evil or even a necessary good. This isn't a show to watch with your kids, but if you are able to handle mature content I highly recommend it. This show is violent, mild- medium gore I think, but it does not have gore just to have gore. The art is wonderful. The voice actors are wonderful. The writing is wonderful. The music is awesome. This is just one of those shows that executes everything it tries to achieve with precision and excellence. The biggest problem with this show resolves itself when you understand more about the universe this show takes place in.This problem is basically that the female characters are all very archetypal female anime characters, and the main character (A female detective) seems unnecessarily bland. Gen Urobutcher wrote the script with Production IG as the animation studio. That's all you need to know. Don't know who either of them are? Madoka Magica and Ghost in the Shell might refresh your memory. Season 2's optional viewing as it fills you in more on the origins of the Sibyl System and to tide people over until Production IG finished up the movie. Season 2 also had a slight decrease in animation quality as Tatsunoko Production was animating it while IG focused on the movie. An Adult Anime...No School Kids. Kind of nice to get an anime geared towards adults and its a damn good one. This is a violent and bloody anime so it's not for kids and has a lot of psychological elements that kids wouldn't understand anyway. It's a high tech thriller based on the premise that you can be arrested for a crime you didn't commit from a scan that gives you a score on how likely you are to commit a crime but it turns out that their are some very rare individuals who can manipulate the readings and essentially most of the series concentrates on stopping and capturing one of these people. Their are some sick depraved people thru out the series most of them being manipulated by the rare person I mentioned above. The violence and killing can get to be a bit too much at times but seems to be a staple of anime's like this you either live with it or you don't despite that I still enjoyed this series as it has great characters and memorable moments hardly any fan service. Would recommend it. Has a great dub on fun. I am not normally into cop shows unless there is some catch and this anime definitely delivers. A dystopia set in near future of Japan where crime is punished usually before any has even been committed via the, you guessed it, psycho-pass (aka Sibyl System). By monitoring various factors, like a person's mental state, the system flags citizens as being potential criminals wherein they are subjugated by police inspectors who are authorized to even use lethal force in the cases of possible murders. Mind you, this is all before they actually commit any crime. Sounds good right? Catching a criminal before they can hurt someone. Well now imagine your that person who maybe is just having a bad day and suddenly your being arrested and tried for crimes you didn't commit. It matters not you didn't actually do anything nor that you might not of because it is enough you just have the potential to have. If you ever ask me for a good anime to watch, I'll probably tell you Psycho-Pass. But for real though, the story is really intriguing. It's dark,it's a thriller and at times, it's funny. Athe anime really explores the idea of utopia and dystopia. Classical Anime Sci-Fi Police Drama. 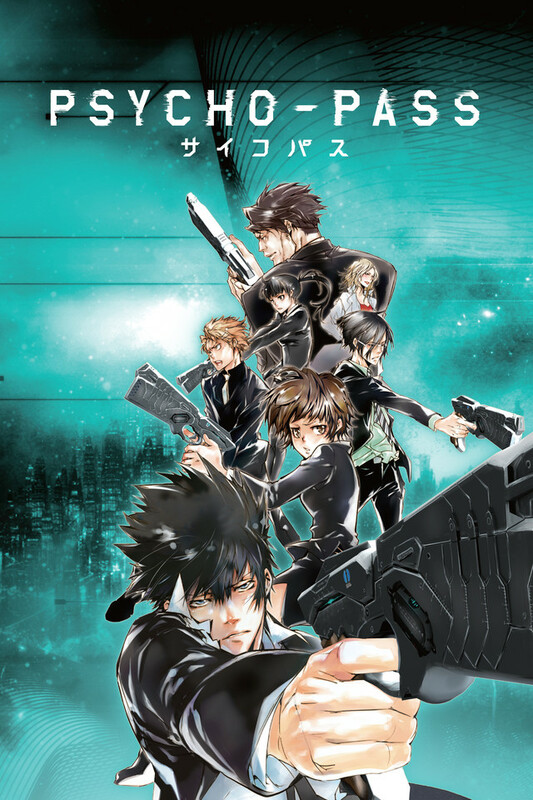 Psycho-Pass is both marvelous and mind blowing. Its dark & provoking, each episode is extremely well written and well done. It also adds some shocking twists in each episode. The incredible work of illustrating Akane Tsunemori character's development change all through the series is truly incredible. I watched this on netflix when I knew nothing about it. Immediately, I was sucked in. This show has that X factor of any great anime. Ghost in the Shell immediately jumps to mind when watching this. Near-future sci-fi with a hint of twilight zone/black mirror.